February 03, 2016 / Holly R.
This week’s Warehouse Wednesday shines a light on this classy Cornwall Wine Cabinet. 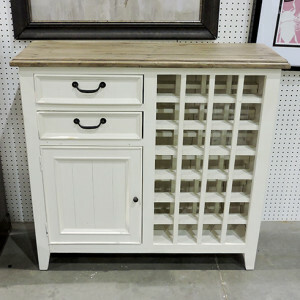 Crafted from reclaimed wood, this chic wine cabinet makes a fantastic addition to any kitchen, dining room or living room! The Cornwall Wine Cabinet can hold 28 bottles of wine, while the drawers and the shelving provide extra storage. The great use of storage makes this cabinet aesthetically pleasing and organization-friendly. The wine cabinet is 41”wide x 14” deep x 39” tall and features a lovely two tone finish, Sundried Ash and Stucco White. You can match existing furniture in your house or have it stand out as an accent piece that contrasts your other furniture. Either way, this wine cabinet would look great in your home. The use of the recycled wood gives this cabinet extra charm with subtle scratches and cracks from the wood's previous use, making this piece very unique and one of a kind!